From Advisors News, May 31, 2017. 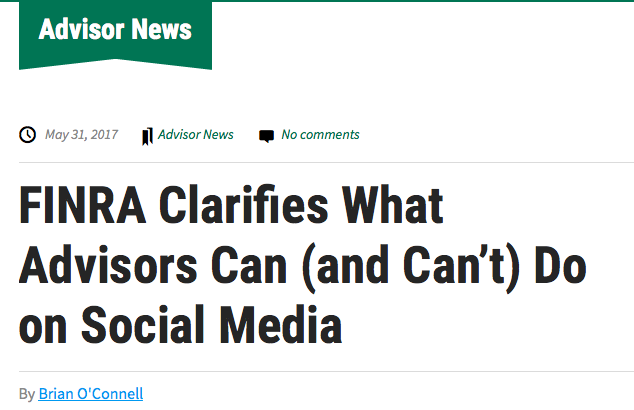 FINRA recently unveiled tough new directives for broker-dealers on their social media practices, with special attention on text messages and use of company materials on private advisor accounts. The entire notice is well worth reading, especially if you’re a financial services professional who uses social media, texts with clients, and shares Internet links with clients. The notice requires broker-dealers to keep records of any text message correspondence, take responsibility for any links or shares to third-party content providers, just as if the firm had created the content itself (but only if the firm had some form of “influence and control” over the content). In addition, BDs can now use native advertising “that complies with the applicable provisions of FINRA Rule 2210, including the requirements that firms’ communications be fair, balanced and not misleading,” FINRA stated. To flesh out FINRA’s directives on common electronic communications made via texts and social media platforms, InsuranceNewsNet.com reached out to several financial professionals who specialize in federal government regulatory issues. On Text/Instant Messages: The notice states that if texts or instant messages relate to an advisor’s securities business, they are subject to all of the communication rules applicable to broker-dealers, explained Donald J. McBride, an attorney with Greensfelder, Hemker & Gale in St. Louis. On Adoption of Third-Party Content: It is possible for a firm to adopt content (such as an article or a video) posted by third parties by using a hyperlink or “sharing” the content, McBride said. “For example, if some firm hyperlinks to a news article, the firm will have adopted that specific content and will be subject to the content standards of FINRA Rule 2210(d), which mandates that content cannot be false or misleading,” he said. If the third-party information itself includes hyperlinks, those sources will not be considered adopted “unless the primary object of the third-party content is to provide hyperlinks or if the additional hyperlinks lead to sources that the firm influences or controls,” McBride explained. Testimonials: Generally, regulators frown upon financial professionals who use positive testimonials in their marketing to new clients, McBride said. “In fact, the SEC prohibits Registered Investment Advisors from using them in advertisements,” he added. Regarding broker-dealers, FINRA’s notice will not consider it a testimonial if a third party posts an unsolicited opinion or comment on a representative’s investment services. “However, if the representative ‘likes’ or shares those comments, the posting becomes subject to FINRA rules,” McBride cautioned. The required disclosures for testimonials are to be provided via a “clearly marked hyperlink” that brings recipients to a webpage with the required disclosures, the new notice stated. This new guidance should give broker-dealers and their representatives a better understanding of their obligations when it comes to text messaging and social media, which have seen increased use among both agents and customers, McBride said. “Firms should always be aware that – regarding the means of communication – regulators will always consider the substance of a communication when deciding whether their requirements of supervision, content, approval and retention apply,” he said. Other financial industry insiders say that, despite the new notice, FINRA remains behind the curve on digital technologies when compared to the real world. “Creating a strong, online brand – including a powerful social media presence is a vital to any advisor’s ability to market in the age of the Internet, but FINRA sure hasn’t made it easy,” said Carole Anne Hardy, president of The Advisors Voice, a full-service marketing firm in Los Angeles. The good news is that the April notice clarifies some important points, Hardy said. Advisors can now share articles on social media, Hardy noted. “The notice specifies that when a firm shares a hyperlink to specific content, it has ‘adopted the content’ and is responsible for ensuring that the content complies with other FINRA communications standards ‘when read in context with the statements in the originating post,’” Hardy explained. Also, make sure the content is not providing investment advice (which FINRA doesn’t allow), and if the guidance in the article may not be right for your audience, say so in your lead-in. For instance, if you see a great article on how reverse mortgages can work for some retirees, your lead-in might read: “New regulations make reverse mortgages more attractive than ever, but check with your advisor to be sure it’s right for you before taking the plunge!” Hardy said. For financial specialists looking to play within the rules, but still leverage the value of social media tools, it’s best to be aware that FINRA is watching. “The best advice is to use common sense and err on the side of caution when making communications that can even be construed as relating to your business as a broker,” Fitapelli said.